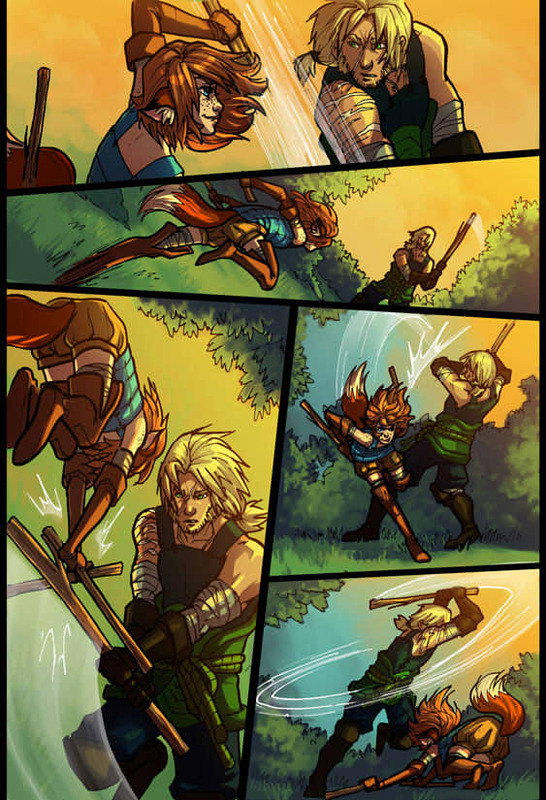 Below, you can find the first fantasy webcomic review, written by Elena Cordero. Please note that we’re still working out some details about the structure of the reviews, so future reviews may look a little different. Tone is one of the most important aspects in a work of fiction. It is what keeps the audience immersed and conveys what the writer wants them to feel. Without proper tone, a fictional work can feel disjointed, confusing, unengaging, or just plain unpleasant. Thus, tone is arguably one of the most important things to decide when beginning a story. In reviewing Fey Winds, a comic by Nicole Chartrand, I’ve run into an dilemma. Like most fantasy stories, Fey Winds begins with a much lighter tone than what it will eventually become. Typically, these stories will leave hints of what’s to come, which Chartrand does succeed in; that’s not an issue here. The Fey Winds site has more than one page dedicated to providing information on the characters, races, and regions within the story, and the comic itself opens up with a rather serious history lesson regarding an ancient war, albeit, a very brief one. Fey Winds succeeds in getting viewers engaged right away, there’s no denying it. It’s premise is quite simple. Long ago, a mystical being called the Sylphe ravaged the lands during a great war. Eventually, she turned on her masters and disappeared from the world, but not before leaving behind trinkets of great power and value. Our protagonists are a group of adventurers in search of these trinkets. Why? Doesn’t matter. The readers are thrust into a story that’s eager to get started, full context or not. Within five pages, the setting, backstory, and our main characters are introduced, all in mere sentences. Our cast consists of a fox who was turned into a human, a swordsman magically bound to go wherever she does, an elf who’s routinely possessed by ghosts, and a runaway prince who can turn into a dragon. The humorous tone of the comic is quickly set alongside our unusual protagonists, complete with The Legend of Zelda references and silly faces. Throughout the first couple of chapters, it quickly becomes evident that our main heroes are not afraid of cracking one liners and jokes at the expense of themselves and the fantasy tropes they come across. Now as I said, it is incredibly common for fantasy stories to display their lighter side up front, and Fey Winds is smart enough to present itself in a more serious light for those with the habit of checking “About” pages prior to reading. The art also helps, with a bit of manga inspired style that’s flexible enough to fit any tone ranging from silly to deathly serious. As the story progresses, the art evolves enough to get some good action scenes thrown in. Panoramic shots and magic filled page spreads become slightly more common, character designs get a surprising amount of detail despite their sillier origins, and you eventually get an acceptable level of lush art most would expect from high-end fantasy. So our tone is now set: lighthearted goofy fun that’s not afraid to get serious as we eventually go more in depth. All in all, we have here the recipe for a fairly enjoyable story that, at the very least, promises to be of acceptable quality. You have your jokes that know when to poke fun at cliché but still necessary aspects of fantasy storytelling, and following this, you have the bare minimum of lore to make the fairly well drawn world feel whole. Well for starters, the humour can be a bit much. It’s hard to say the balance of humourous and serious tones is maintained well when phrases like “le sigh” and “omg hax” are sprinkled in ever so infrequently enough to feel jarring every time they pop up. It could also be because the lore presented alongside the comic is hardly ever touched upon in the comic itself, serving more as a glossary than anything else. Or maybe I just don’t like how the pages felt too small at times and the border surrounding the comic is just bright green space, making early pages a bit of an eyesore. It could be a lot of things. For me, the real kicker is that, a mere two chapters into the story, out of what is currently 12 and counting, everything established is thrown out the window. After getting little to no time to see our heroes interacting with each other, we’re introduced to our first main villain. Backstories suddenly become complex, revealing connections surprising enough to be consider spoilers despite happening so early in. Our villain’s goals and the main protagonist’s role in it are suddenly brought out and change what little we know about the story completely. All at once, the comic’s more serious tone comes charging in at full force. And now, some readers give their best “ahhhh now I get it” as my nitpicking comes full circle. My introduction to this comic felt like it was establishing a lighthearted adventure with a touch of serious mode thrown in. Despite the characters being a bit too silly or on-the-nose at times for me, I was still relatively sold on the premise. What I at first thought was a cheerful fantasy adventure, though, was in actuality a very lengthy and extended prologue, setting up our characters and who they are before the plot literally ambushes them when they least expect it. I return to what I said at the beginning of the review. Fey Winds has presented a dilemma to me. One that makes a standard review formula quite difficult, to be honest. You see, it can be a problem when a story just shifts tone suddenly. Some people might think it’s jarring when we have enemies called “The Minionz” in the exact same chapter as one where a character is violently tortured by our true antagonist. Others might feel it was not necessary to establish backstories that will become completely irrelevant or exposed as flat out lies a hundred pages later. There’s a lot in Fey Winds to make you raise an eyebrow. But this doesn’t have to be an issue, in all fairness. I can’t exactly blame the comic completely for my own expectations. The humour doesn’t outright stop once the plot kicks in, and the lore and setup was all there, making sure I knew exactly what I was getting into. What really matters is how the story develops after it gets going, regardless of the time it takes to get there, so a sudden tone shift less than a quarter into the story is a rather minor offense, is it not? Our heroes seem to agree, at least. But the thing is, nobody likes it when a story holds off on the main course for too long. A solid start and fairly developed follow-up can and will be ruined if the transition between the two is too sudden and awkward. For some, the warning of how abrupt these shifts are is concerning, regardless of how interesting the resulting storyline is. For others though, they are minor nitpicks that don’t detract from the big picture, as long as all you care about is the overall experience and knowing there aren’t bigger issues plaguing a comic. This was my dilemma. Fey Winds has good art and a unique world. The characters are likable and the story goes interesting places, even if it doesn’t explore those options as much as one would prefer. There are flaws, but they can range from deal breakers to minor infractions, depending on why you read webcomics in the first place. The comic delivers exactly what I expected from it and provided an adequate adventure once it eventually got the misshapen ball rolling. How far that gets you will have much mileage. It will not be your new favourite, but there is enough here to potentially overlook its flaws for a rainy day. Fey Winds is, at the very least… acceptable. This is an impressively in-depth review! Please keep doing these! It felt like you spent the whole time writing about the shift in tone. My idea of a review is half description of whatever is being reviewed is doing or attempting to do and half assessment of how well it succeeds at doing it. You might have done this, but it was all to the tune that the tonal shift is a major problem, one that you don’t even pronounce a definitive sentence on – is it a problem or not? “our rating system is much more strict than most” I’ve seen this so many times and it’s never held up before. If you present a score statistically normalised against your other scores that would be more believable (impossible I know because of the current sample size of one). I think there should be more listed strengths and weaknesses, the two picked don’t add anything to the text of the review. I recommend at least four total. Also I would break out story into plot and characters, perhaps marking them out of four in the process. Excellent production for this review page though. And to soften the blow, no-one notices the bits that are just working as expected, no matter how much effort goes into ensuring that they do work. NB: I have not read the comic. “Fey Winds”, hmmm… I remember having read some pages a while ago, but didn’t keep on. I wonder if it was because of the same reasons explained in this review. But the art is quite good nonetheless, are you sure it’s not a 4/5 at least? Just noticed that the review is here and in http://www.sandraandwoo.com/gaia/2015/11/28/webcomic-review-fey-winds/ … I can understand that you want them to appear on both the Sandra & Woo and Gaia websites, but, wouldn’t it be possible for both of them to end up being the same actual page? I’m just saying because I think it would be more interesting to have all comments together. @all: Thank you for your feedback. It is very helpful for improving the quality of future reviews. I can understand that you want them to appear on both the Sandra & Woo and Gaia websites, but, wouldn’t it be possible for both of them to end up being the same actual page? Why exactly are you reviewing other webcomics? Not that I’m complaining, but how does it benefit sandra and woo or Gaia? Either way I thought it was informative and thorough. I might check out Fey Winds. Sorry, it’s hard to take this review seriously. Partially because I have no idea who Elena Cordero is, or why I should care about their opinion of webcomics. Partially because a perfectly functional website got two of five stars. Any maybe a bit of it is because Fey Winds is a hell of a lot better than the comic that the review was posted on. Waait a second. What the heck did you do to the images, anyway? Crank the JPG compression? Rescale by five pixels? Because those are a lot shitter for being the same size as the actual comic pages. Just because someone’s comic isn’t as good as another comic, doesn’t mean they can’t give a critical review of it. I could use your accusation straight back at you, and ask you: Do you have a comic that’s better than this one? If not, then you apparently have no right to judge it. Not everyone’s going to agree on all the reviews, that’s not what a review is for. Reviews are there to inform people of the writer’s opinion of a certain something. If you don’t care about Elena, then don’t worry about the reviews, unless it actually seems like slander (Which an honest review is not). And remember: Just because you don’t agree with a review, doesn’t mean it’s wrong. It just means that whoever is reviewing it has a different opinion of it than you. Sure, you can. But like I said, I have no idea who this reviewer is, or why I should take their views seriously. All I have is the fact that it was posted here. You’re absolutely correct that me not agreeing doesn’t make me right and Elena wrong. On the other hand, Elena’s review can be pretty much summed up as ‘don’t bother reading,’ the sample pictures all suffer JPEG artifacts that don’t exist in the original pages, the webcomic gets low marks on it’s website… Bluntly, it reads like a hatchet job. And again, that doesn’t make Elena wrong, but I am certainly going to do my best to alert people to what I see as a problem. But what John’s actual argument comes down too, is credibility. For instance; we as the visitors of this site (some of us at least) do not know who Elena is. Therefore, we do not know whether we can trust that the reviewer may have similar tastes as us. When reading reviews, readers tend to gravitate towards writers who show a common level of interest in a subject. For example, if Novil was listed as the reviewer, the visitors of this website would feel more comfortable with absorbing the advice of someone they feel that they at least seem to know. And common interest is apparent, from the fact that they were on this site to begin with. As far as better/worse material; one must keep in mind context. If the antics of sandra and woo are being compared to the comic in question; which is really better? The answer is neither. The point of Sandra and Woo is for a semi daily, humor comic, with loosely connected story lines. There is no real over reaching arc, or ultimate story. If you are comparing it with Gaia, well, sounds to me, that they are fairly equal. Gaia too, has had its issues with tone shifting; and getting lost in a story arc that is dragging on a bit much *caugh* “do something in this town already” *cough*; but ultimately, it has a fully developed story, interesting characters, and great art work. When comparing apples to, its all about context. Overall, I liked the review, and understand where the dilemma comes from; and I will be checking out the comic based on it. I am not personally overly concerned with tone issues. These things take time to balance out. Oh, and as far as the website rating its self… look closely, you will see that it got 2 out of 3 stars, not 5. Which is a 66.66666% rating. not bad actually. Wow… I was going to read Fey Winds after reading the review, I’d opened it in another tab and everything, but having read your comments I don’t want to risk that you’re in any way associated with something I read.